Firstly, you need to find professional residential or home painters who know what they are doing. Secondly, you need to find painters who are easy to talk to and understand your unique residential painting needs (e.g. time frame, costs, paint types, and colour selection). After all, every house is different. Third, you must use painting companies who are fully insured. This will give you peace of mind and assurance that you get what you pay for and in the event of a mishap you are covered. You may come across several house painting companies, but there’s just one name you can trust — Jim’s Professional Painting! Call us now to enquire about our residential painting services. Our residential painters will consult with you on paint types, colour selection, time frames and costs to integrate your needs into a direct and affordable solution. Many Australians use Jim’s network as a preferred supplier because the name is synonymous with quality and that’s a reputation you can’t buy – we’ve earned it and we invite you to experience the Jim’s Professional Painting difference. Jim’s Professional Home Painters only use the highest materials from renowned suppliers so you can feel confident that your home is receiving a makeover that will last for years to come. Apart from our residential painting service we also offer colour consultation, wallpapering, staining and even paint removal so please enquire about these when you call. With the famous Jim’s 100% satisfaction guarantee you can rest assured that you are in safe hands. 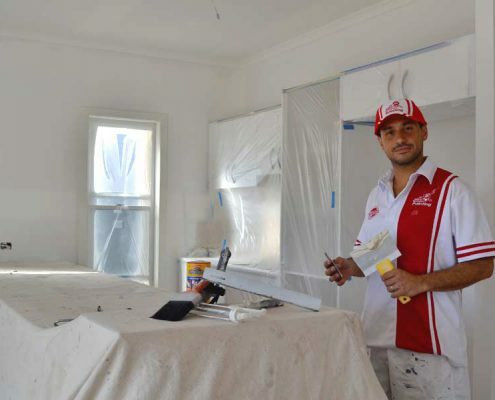 To enquire about our residential painting services call 131 546 or fill out our free quote today.